The basic SAAB 9-3 was launched in 1998, born of the need to improve the aging dynamics of the 900 (94-98) model. The 9-3 reputedly boasted 1100 changes from the model it replaced, these included higher front suspension turrets, SAAB’s new active head-restraint system, and various changes to the body including relocation of the high level brake light, a fresh new grille in the style of the recently released 9-5, and perhaps more importantly – the return to a hydraulic clutch operating system! The 9-3 has proven to be a successful car in all it guises, with positive press comments from all over the world, however many say the 9-3 is simply the car the 900 should have been when it was first released in 1994. The first ideas for the 9-3 Viggen started life back in October 1994, with the arrival of SAAB’s SVO (Special Vehicle Operation) project, headed by Peter Leonard this was part SAAB and part TWR. The level of interaction TWR played at this stage of the SVO is a somewhat cloudy issue, however with TWR’s name made in motorsport development and tuning, it seems reasonable to assume they played the biggest part in the chassis and handling development work, leaving the styling and engine work to SAAB’s engineers. With the backbone of the SVO project in place, the engineers immediately started working on a High-Performance variant of the 900 model, and late in 1995 they presented the world with the first visual clues to SAABs future direction in high performance – a heavily modified Yellow 900 Coupe, and an equally heavily modified blue cabriolet. 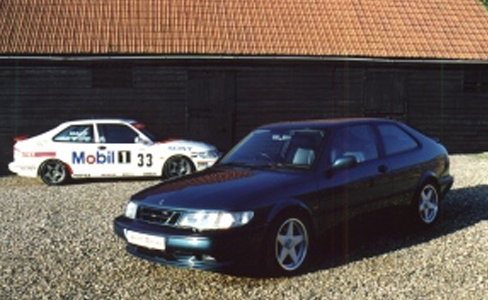 The two models were shown in the February 1996 issue of “SAAB Magazine”, at that time Peter Leonard estimated the models could be available in late 1997, with the possibility of 250 Bhp. No indications were made at the time to suggest if the cars used the 2.0 or 2.3 engines, but in order to obtain a reliable 250 Bhp for the world market, a 2.3 would be the safest assumption. The SAAB community was rightly impressed with the two aggressive SVO cars, but it would be a further two years beyond the estimated date before the public would be able to taste the fruits of the SVO project for themselves. Pictured above, the SVO 900 Coupe, as presented in late 1995 to the public, many of the parts fitted to this car including the front and rear bumpers, made their way to the Viggen almost totally unmodified. Sadly however, the large AP Racing brakes front and rear, two-tone black/yellow interior and exclusive three-spoke alloy wheels slipped from the production list, along with 20 Bhp. Closely following the design of the SVO 900, the development of the Viggen was again a split affair, partly using information and parts developed during the SVO project, and partly with new components and ideas worked on by TWR. The body styling was almost an identical copy of the SVO, however the chassis and handling work was all TWR’s input to the project. A huge amount of time went into making the Viggen as good as it could be given its slightly questionable chassis underpinnings and just before its release, rumours of the Viggen being a 270 Bhp monster leaked out, perhaps totally fiction, but a wonderful concept none the less. When released however, the Viggen was 230 Bhp – some considered it a “detune” from SAAB’s original concept… We’ll probably never know for sure. In mid-1999 the Viggen was finally available in SAAB showrooms, powered by one of SAAB’s new generation of lighter engines, the B235R. In factory trim, the Viggen had power figures of 230 Bhp, and 258 lb/ft of torque – a lot of power and torque for a front wheel drive car by anyone’s standards. The ‘R’ part of B235R determined that this engine was “High-Output” – to that end, SAAB engineers fitted the B235R with a number of enhancements to improve the engines resistance, efficiency and performance. The first significant enhancement for the Viggen, was the use of SAABs new Trionic7 Management system, as found in the 9-5. This highly integrated system provides boost, fuel, ignition and throttle control from one electronic control unit, and theoretically allowed the engineers to ensure that every Viggen performed consistently to the next, regardless of altitude or climatic differences. As of model year 2001, all SAABs use the Trionic7 system. Following the electronic improvements, their attention turned to the mechanical components, the biggest change was the fitment of a larger turbocharger than you would normally find on a 9-3, this was to ensure that the Viggen never ran out of boost, even at altitudes of 10,000 ft, the Viggen will still retain its performance. In order to cope with the boost levels from the turbo, the exhaust valves are made of Nimonic Alloy, a high-nickel content aerospace alloy well known for its heat resistance and more commonly used for the manufacture of Jet Engine exhaust nozzles. With the large turbo fitted, a new intercooler design was needed, the standard 9-3/900 unit was replaced by a more efficient cross-flow type intercooler with a larger heat dissipating core. Finally came improvements to the bottom-end of the engine, these taking the form of nitrided gudgeon pins and more sturdy connecting rods. 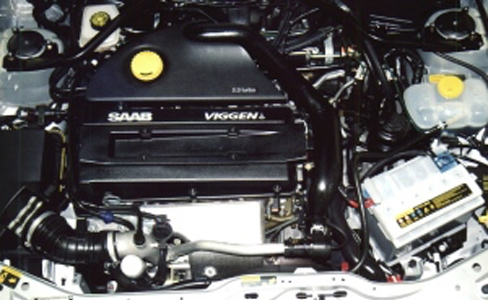 Pictured above, SAAB’s immensely powerful B235R Engine, as fitted to the Viggen. This same engine would be used one year later to power the 9-5 Aero – but without the Viggen cam-cover logo! With all the engine improvements in place – the B235R has 14% higher volumetric efficiency than a Porsche 911 Carrera 3.6 – quite a feat for a 2.3 litre 4-Cylinder. Despite the intense efforts of TWR to fix the Viggens inherent power delivery problems, there were no true “engineering” solutions developed to achieve this goal. The most effective solutions (now employed with total success in our Viggen Rescue Kit) should have taken the form of suspension pickup point relocation, and changes to the bushing materials used, to prevent the lower suspension arms from moving fore/aft when changing from on to off power, this would also have improved the braking feel which from high speed on uneven surfaces feels far from focused. TWR’s Final tune of the chassis, only consisted of changes to the springs and dampers and miscellaneous steering bushes, these items did little, if anything to correct the torque-steer problem. Final cosmetic touches for the Viggen come in the passenger compartment, with unique two-tone seats, an excellent steering wheel, and a custom dashboard facing (hated by some, loved by others – looks rather like a kitchen worktop, and is purely a question of taste!). The seats were developed by Lear and provide superb support in all the right places, and always manage to locate you exactly in the centre of the seat, regardless of how hard you are cornering. The name Viggen (The Swedish word for Thunderbolt) comes from SAAB’s highly agile JA37 Viggen jet-fighter, a highly appropriate name for SAAB’s highest performance model. Pictured above, our ARM T16 – tested exhaustively by the motoring press – with positive responses every time! The feature list for our ARM T16, is remarkably similar to that of the Viggen, the main difference, is that our car has been available since the model was first released in 1994. Our ARM T16 was taken to the SAAB factory in Trollhatten, Sweden in late 1994 at the request of the SAAB GB Marketing director – for “assessment” by the factory marketing and technical personnel. We like to think that it was our efforts with the ARM T16, and positive demand from our customers – that inspired SAAB to build the SVO concept cars, and later on – the Viggen. Pictured above, a standard Monte Carlo Yellow 9-3 Viggen. When the Viggen was finally released to the public, it really looked the part, if a little high on its stiffer springs. However, universal press criticism in Europe leveled at its overwhelmed and underdeveloped suspension, meant sales doom for the somewhat pricey Viggen. As a daily car, the Viggen is as easy and forgiving to drive as any SAAB, confident and sure-footed the Viggen provides you with almost unstoppable overtaking power, and effortless acceleration way into the 100Mph+ zone. However, when driven hard on a challenging twisty road, the quite violent torque steer and aggressive power delivery really show the Viggens dark side. Capable of leaving 20 metre plus, steaming black scorch marks from the lightly loaded inside front wheel, the Viggen has more power than it does traction and over bumpy or rutted roads is not a SAAB for the unwary driver. It takes a considerable degree of confidence and skill to really drive a Viggen hard when weather conditions get difficult, so SAAB addressed this issue in the US by fitting traction control as standard – however it remained an option in the UK, much to the confusion of the UK motoring press. Despite traction difficulties, SAAB stalwarts bought the car, appreciating its individuality, fine interior and seats, seamless brute power, and good looks. The estimated total world production for the Viggen was set at 3000, with 500 of those destined for the United Kingdom. However, the sales target of 500 was never reached in the UK, therefor making the Viggen a rare and exclusive car on British roads. 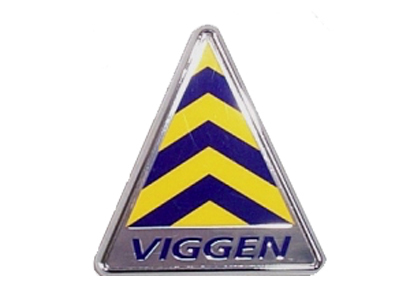 Pictured above, SAAB’s Viggen logo, first on the SAAB JA37 Viggen Jet-fighter – and now on the SAAB 9-3 Viggen road car. 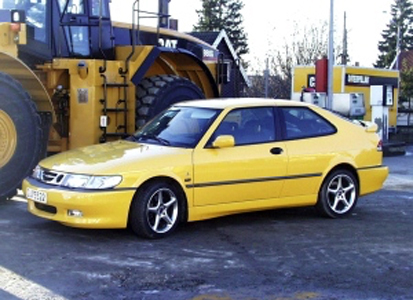 With our unique SAAB knowledge, the Viggen rescue pack was produced to offer the somewhat disappointed customer the option to make substantial improvements to the Viggens dynamics. We can near totally eliminate the torque steer that the Viggen is famous for, and have received much press acclaim for our work on the Viggen chassis. Journalists are united in their opinion that our rescue kit turns the Viggen into the car it should have been from minute one. Obviously with the chassis shortcomings fixed – more horsepower can be added, to that end we offer a range of power enhancements to give the Viggen some scary horsepower, and immense performance quite beyond that which most people believe possible. Our 1999 Silver Viggen Coupe has been improved by fitting the Viggen rescue kit, and exhaustively tested by the British motoring press, who all agree that it is a superior car when compared to standard. Our Viggen is in constant use, as new products are developed and tested and each time we drive our Viggen, even over short distances – we come back with a smile. From the throaty blare of the exhaust – to the immense overtaking power, every journey in the Viggen is a enjoyable journey! Pictured above, L5AAB – Our Silver 1999 Viggen, fitted with 18″ Speedline Supertourismo Alloy wheels, Suspension Kit, Power upgrade, Carbon-Fibre Dashboard, Viggen Rescue Kit and Sports Exhaust system. The fastest point- to-point SAAB money can buy. Today Abbott Racing is the World Leader in all things Viggen. Over 10 years experience gives us unparralled knowledge in Tuning and Maintaining these unique models. We are also No. 1 when it comes to buying and selling Viggens whether it is the Coupe or Convertible model. We carry out all body repairs,restorations, transmission and engine overhauls as required. Our World famous “Viggen Rescue Kit ” eliminates torque steer and improves steering feel 100%. 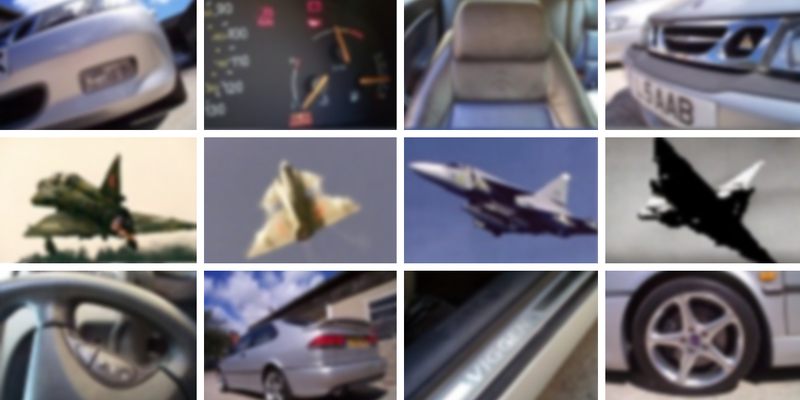 We keep a count of all the Viggen models that grace our workshop .and we reckon we have seen over 275 of the 350 or so that came to the UK in 1999/2000. 22/08/2001, Daniel Watson. Abbott Racing Motorsport. No unauthorized duplication of this article in any part without prior written permission. This article is historically true to the best of our knowledge and has been written as accurately as the available information allows – if there are inaccuracies, please e- mail us. E&OE.